Solar roofs are one of the latest ideas in solar technology. Spearheaded by Tesla, the concept is to have a link-up between your solar tiles on your roof, the solar battery on the side of your house and, of course, your new electric car. In this article, Energy Matters unpicks the hype and unpacks the headlines about Solar Roofs. You may not be thinking of going the distance quite yet, and forking out some hefty Aussie dollars to be an early solar roof adopter. But it’s worth taking a closer look at the tech. Also, these big-shot ideas can spur on other innovations and streamline prices, which we’ll look at too. 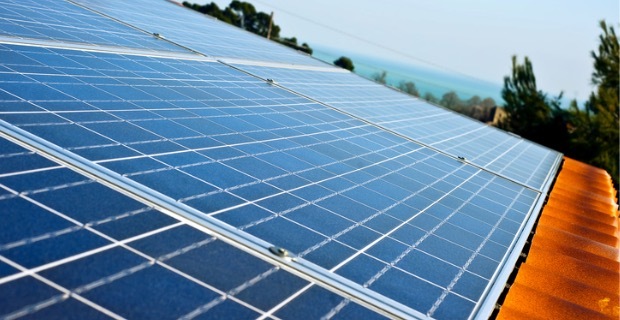 Solar roofs and solar tiles could be the next big thing in renewables. What are solar tiles and how much do they cost? Tesla’s concept is that a whole roof will be made up of solar tiles. But what are solar tiles exactly? Well, they work in the same way solar panels do, by turning sunlight into electricity. But they can be fitted onto your roof snugly to match the design you want, and they look like regular roofing tiles. Tesla offers a number of styles: Tuscan Glass Tiles, Slate Glass Tiles, Textured Glass Tiles and Smooth Glass Tiles. In the US, homeowners can expect to pay around AUD$28.4 per square foot for the Tesla solar roof, fully installed. As Gizmodo reports, there are two types of tile – ones with solar cells, and ones without, and the price includes 35 per cent of the tiles as the active power generating type. According to Tesla’s Solar Roof web page a typical 2,000 square foot home in California’s Bay Area would need a $67,911 Solar Roof to offset the energy needs of a $260 monthly electric bill. Remember that there are two different kinds of tiles in the roof: solar and non-solar tiles. The ratio of solar tiles to non-solar tiles will affect the cost per square foot of the solar roof. Initial reports have shown that non-solar tiles cost $14.2 per square foot, while solar tiles cost $54 per square foot. Still, Tesla is targeting the higher end, so let’s use the $168 per square metre figure. That means the Tesla solar roof is about 2.5 times more expensive than a comparable non-solar roof. The tiles have a 30-year warranty. Tesla suggest that at the $28.3 price, the ongoing solar generation over 30 years makes the roof cost-competitive with a normal roof. Are solar roofs just attractive or are they worth the investment? Are they available in Australia yet? According to Reuters, Tesla began manufacturing its solar roof tiles at the company’s New York factory last month and has started surveying the homes of customers who made a deposit to reserve the product last year. Tesla offers both solar and non-solar tiles. According to Elon Musk, customers could cover between 40 and 70 per cent of their roofs in solar tiles, depending on the size of their roof. In a press release Tesla explains that although the upfront cost of solar tiles are more expensive, it can be offset by the energy the tiles produce. You can pre-order the Solar Roof with a $1,310 deposit on Tesla’s website, with installations kicking off in Australia this year. What are the drawbacks of solar roof tiles? For solar to work, each cell needs to be protected from corrosion, so it is encapsulated behind glass and plastic. These protected materials are “waste”; i.e. they do not add to the core function. A solar tile requires a lot of waste material for each cell. Roofs are designed and built to keep out the rain. Modern sheet metal roofs do this by using large sheets of steel with few joins or overlaps. In contrast, tile roofs have many joins and gaps. Each gap is a failure point. Once the home owner has committed to a specific make and model of solar tile, they are locked in. Any upgrade, extension or repair has to use the same brand of components. In contrast, standardised 60 cell modules are a lot more interchangeable, especially if the system uses DC optimisers or micro inverters. In that case modules can be completely mixed and matched. To make best use of a roof area, it needs to be covered with solar cells. If the cells can only cover a small amount of the roof, owing to the wasted space between each tile, then the yield will be much lower. In contrast, standard modules can fit more cells onto a given roof area. What is the market? Why is Tesla making solar roofs? Right now, solar roofs are for high-end customers who have solar panels on their roofs but want a better aesthetic. This is likely to change in the longer term, when production increases and solar tile prices drop. At present, solar tiles are at the bottom of the list for environmental or financial return on the dollar. So why is Tesla doing investing in them? It’s all about brand positioning. Tesla is doing it to position the Tesla brand at the premium end of the market. Tesla gets lots of free advertising, and the product attracts people to their other products. Most people will end up purchasing Tesla’s standard 60-cell framed modules, and put them on top of a tile roof. They will feel happier that they have bought the “almost best” product from the “best” brand. What are the advantages of solar roof tiles? You value the aesthetic of clean roof lines. You live in a heritage conservation area that prevents the installation of solar panels. Your north-facing roof area faces the street. Your sunny roof area is the wrong shape or size for conventional PV panels. There’s no need to drill holes in the roof to install the tiles. They’re not bolted onto the roof, so there’s no extra strain from natural wind flow. They’re much more resistant to cyclonic winds than solar panels, and in strength and impact testing for hail damage, they often perform as well or better than conventional roofing materials. Solar roof tiles are also known as building integrated photovoltaics (BIPV). BIPVs are part of the roofing material, discreetly integrated with similar-looking non-solar tiles. Australian company Tractile has developed a patented, interlocking roofing tile. They provide an innovative combination of interlocking system, high performance composite materials, and solar technology to deliver a 4-in-1 solution for roofing, insulation, electricity, and heated water. There’s a 30 year product review. Monier has been putting roofs on Australian homes for 100 years. Five years ago it launched its Solartile, made with monocrystalline cells. Monier claims these solar tiles were the first BIPV roofing product in Australia. sonnen has stepped up to challenge Tesla in the Australian market for energy storage paired with solar roofs. The German home battery storage company’s Australian branch has teamed up with Bristile Roofing to deliver storage systems alongside the latter’s solar roof product. As reported in Greentech Media, sonnen plans to release its solar product in September and start targeting the 102,000 new-build homes expected in Australia during 2018. A future alternative to solar panels? 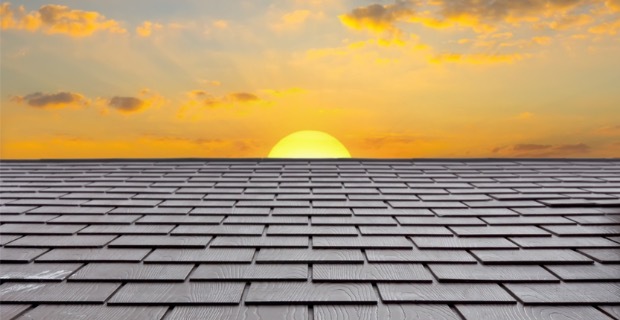 Oliver Koehler, CEO of solar shingle and tile company SunTegra, thinks the next generation of solar customers want a low-profile, more integrated solution that blends in with their home. Interviewed by Greentech Media, Koehler said until now most customers didn’t know there was an alternative to solar panels. He said that based on information released by Tesla, the installed price for non-solar glass tiles is approximately $11 per square foot. Conclusion: Solar roofs replace solar panels? The idea of solar roofs is getting traction, thanks to big announcements and launches from Tesla. It’s often the case that hyping new products brings the concept to people’s attention, then they buy one of the cheaper products. It’s worth noting there is a lot of talk about prices and every installation is different. The main customers for roof tiles right now will be households and businesses who want an attractive roof with the benefits of renewable energy, and are willing to invest more to achieve this. But for now, the Tesla Solar roof is not a solid investment compared to normal solar. It probably will be around the third generation, as prices are driven down by scale. So, for anyone looking at ditching those solar panels for tiles or splashing on a full solar roof, it’s worth looking at the economics and the options first. Or maybe, holding off for a while until prices are more reasonable.